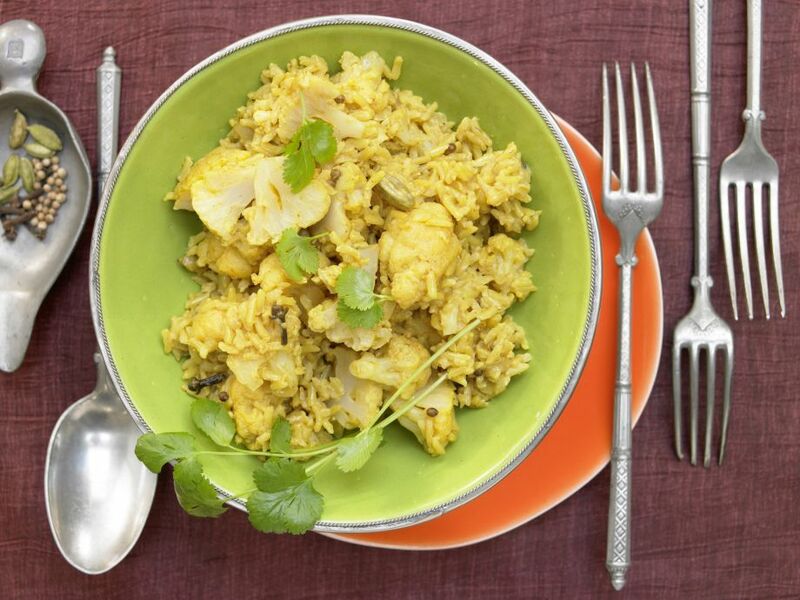 Cauliflower Rice Pilaf - This Indian recipe is so good, it could almost pass for dessert! 1 Trim cauliflower, rinse and divide into small florets. 2 Peel the onions and garlic and dice finely. 3 Heat oil in a heavy oven-proof pot. Add cardamom, coriander and cloves and sauté while stirring for 2 minutes over medium heat. 4 Add onions and garlic and sauté for another 3 minutes while stirring. 5 Add rice, chili powder, turmeric and cumin and cook for 30 seconds. 6 Add cauliflower florets to rice. Add the coconut milk and gently stir the entire mixture. 7 Add just enough broth to cover the rice and cauliflower. Bring to a quick boil. Cover the pot and bake in a preheated oven at 180°C (convection oven 160°C, gas mark 2-3) (approximately 350°F/convection 325°F) for about 35 minutes. Alternatively, for stovetop cooking, simmer covered over low heat for 20-25 minutes. Season rice with salt and pepper to taste. Rinse cilantro and shake dry, sprinkle cilantro over the rice and serve.